Amazon is always ahead, damn them! 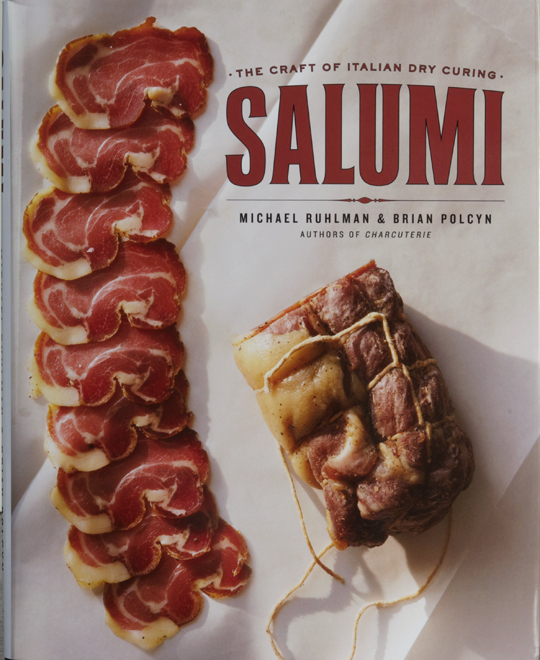 They’d been advertising an August 27 release date for my new book, Salumi: The Craft of Italian Dry Curing, but suddenly I’m getting twitpics from people who have ordered and already received their copy! The video isn’t ready, but you folks clearly are, so here it is, Brian Polcyn’s and my Salumi, the follow-up to our previous love song to animal fat and salt. The new book focuses on dry-curing meat, both whole muscles, such as coppa and pancetta, and ground meat, such as salami. Charcuterie encompassed a broad range of preserved foods, including pâtés and confits. With a couple of exceptions (mortadella, the sopressata of Tuscany, which is the Italian version of french fromage de tête), salumi refers to salted, dried meats that are, when done well, with well-fed, well-raised pigs, some of the best foods on the planet. I would argue the healthiest, too, though American nutritionists would be all over me for that (let’s define “healthy” first, can we?). I think Brian is most proud of how we’ve defined and illustrated breaking down the hog, both in the American style, but more importantly in the Italian fashion, which is designed both to follow the natural seams of the animal, requiring only one saw cut, but also to take advantage of the best salumi cuts. In America, we slice right through the coppa, for instance, the long neck and back muscle that segues into the loin. In Salumi, we show how to capture the entire coppa, which is one of the easiest and tastiest cuts to dry-cure, with its perfect interior marbling. 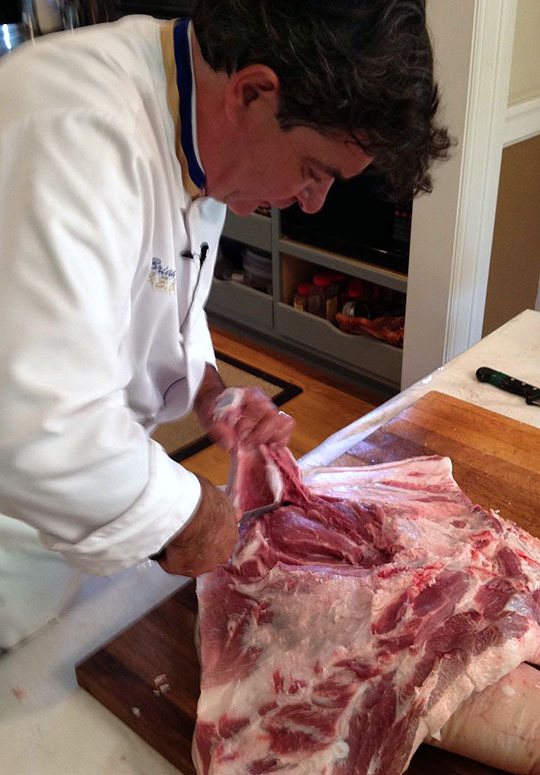 Brian removing the shoulder blade of a Berkshire hog for spalla, dry-cured shoulder./Photo by Michael’s iPhone as we taped the promo video. 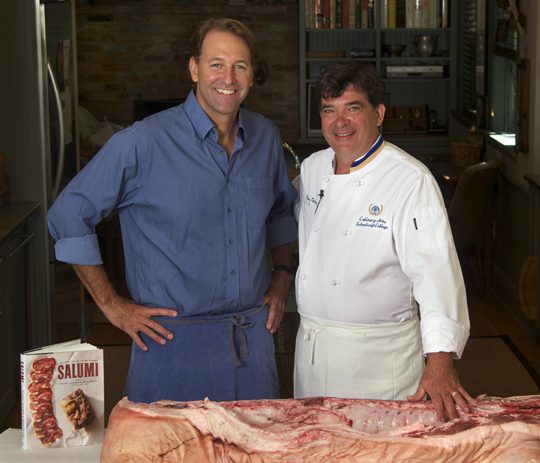 For me the pleasure in writing it was the revelation of how simple salumi actually is. Walk into a salumeria and you might be overwhelmed by the variety and seeming complexity of its offerings. But in fact the entire craft of salumi can be broken down into eight basic categories, and that’s how we organized the book, first describing butchery, dry-curing basics, the fundamental techniques, the eight basic categories of salumi, variations on those categories (more than 100 recipes), then how to put salumi to use, whether you make your own or purchase it from the burgeoning salumerias around the country (see below). As with so many ancient culinary traditions that America learned only recently (great cheese, wine, beer, charcuterie), chefs and home cooks have already embraced the Italian traditions of salumi with passion. It makes us proud. It also is yet another example of why there’s never been a better time in America to be a cook. My recent post on our trip to Italy. My past post on Salumi in America. Another great post, Artisan Butchers (Does Artisanal Mean Anything Anymore?). Salumeria Biellese is one of the oldest shops, if not the oldest, selling beautifully crafted salumi in the country. Also among the country’s salumi leaders: Salumi Artisan Cured Meats, Mario Batali’s father’s shop in Seattle; Paul Bertolli’s Fra’ Mani and Chris Cosentino’s Boccalone, both in the Bay Area; Herb Eckhouse’s La Quercia in Norfolk, Iowa; and Elias Cairo and Co.’s Olympic Provisions in Portland. For those I left out, please provide links in the Comments and help spread the word! Congratulations! I am looking forward to receiving my copy… Your ‘Charcuterie’ book opened up and presented so many new things to me, thank you. Will you be selling autographed copies from the website? I want to eat that cover. I’m going to assume that’s Donna’s photo. Beautiful and congrats. I should get mine today and I could no be more excited. Using my wine fridge for making Salumi has been working very good (I just made a great Bresaola and cured/dried it in there). Looking forward to the butchery section most of all, especially how to properly recover the copa. BTW, Sopressata is really head cheese?? Isn’t it just another type of salami? Maybe I am missing something…. in Tuscany, it’s headcheese, elsewhere it’s salami. nutty Italians! Another quality salumeria is Il Mondo Vecchio in Denver. [ ilmondovecchiosalumi.com ] Owner Mark DeNittis teaches several classes around town, and is an enthusiastic ambassador for the craft of sausage-making. I am a sausage snob. I learned from my Father in law who is eastern european. I loved “Charcuterie”. I will be purchasing this book as soon as I can. I live in CT. Do you have any recommendation in CT or NYC for some good artisan cured meat? Also if anyone is interested…we have a Facebook group where anyone can discuss curing meats. Thank you. I used your map this weekend. I was in Vermont and stopped by Vermont Salumi and Vermont Smoke and cure. Do you go over curing chambers and are there how-to;s on them at all? as best as we can, every situation is different. and there are no small home versions available. we don’t have instructions on how to build your own. I agree with Kris. How about a curing chamber design? again, no, but for tinkerers who like to do that it’s googlable. congrats on the new Book- can’t wait to see it! Michael, that date is actually set by your publisher. It’s always hard to guess when a book will be in stock, though. Congratulations on publishing! Auguri! But please let’s not assume that these new US salumi makers have invented a tradition–they celebrate one created by the many independent salumerie that dotted the Italian neighborhoods of New York, Philadelphia, and other cities–and still do, like the Calabria Pork Store in the Bronx, Bari in Brooklyn, and Salumeria Biellese in Manhattan. These folks were (and are) rightly “artisans” even if they, nor anyone else, ever called themselves that. I unexpectedly received my copy last night, very happy! Waiting for me when I got back from the Dentist. Congratulations. Received mine today – two days before expected – have a wine fridge designated for this very purpose and can’t wait. CONGRATS from Martha’s Vineyard! Can’t wait to see the book! I like your note: “let’s define “healthy” first”. It’s about time! I think I am becoming a Michael Ruhlman’s books collector. Waiting eagerly to receive this one… Thanks, Michael and Brian! I love a hardcover cookbook, but they get so abused in my kitchen, at least the good ones; like Charcuterie. I’m debating on getting the Kindle version, no food stains or wrinkled pages, easy to access anywhere, but to have them side by side on the shelf seems like the way to go. And I’m a sentimental fool by nature. Need a cocktail post so I can think about it properly. I love electronic versions because they’re so easy to search. I am out of town, but I can see that my copy has been delivered to NYC. Can’t wait to read it. Both my grandfathers were butchers; my grandfather in England was a pork butcher (he made the pork pie you like so much). My wife pre-ordered it for my birthday. It’s hidden somewhere in the the house but i don’t get it until 9/6. It’s killing me! youre learning the first skill of salumi. patience! Just got the book today, and it looks great. Really happy to see a recipe for Nduja. One place you didn’t mention is The Fatted Calf in SF and Napa (www.fattedcalf.com). Great selection of salumi and other charcuterie made with heritage pork in house. my apologies to the fatted calf. there are getting to be too many to keep track of! Received my copy on the 16th as well. Can’t wait to dive in. Bringing a large black to butcher on Wednesday and will be starting a guanciale this weekend. Can’t wait! I am definitely buying this book. I don’t know if it has been mentioned but you must include in your listing of salumerias Salume Beddu in St. Louis. I am on a temporary work assignment here and have been enjoying their local product. They supply many restaurants in the area and have been on several of the national cooking shows. See their product at salumebeddu.com. thanks for adding another salume source to the list! Just got my copy. Outstanding. Brilliant sequel of Charcuterie. Have been supplying a restaurant in São Paulo, Brazil, with salumi cured and aged thanks to your guidelines (and Bob del Grosso’s advice through email…) since last year. Great work, many thanks. I add my Congrats – unfortunately I have to wait for Christmas to read it, since the kids saw this and said “We know what to get Dad”. Is the Italian butchering similar to Austrian seam butchery? Already have some lonza curing in the wine fridge., thanks!…just thinking..any advantage to vacuum sealing after a dry cure is applied? Maybe eliminate weighting and or overhauling? Received Salumi last week. Great work. After my first look-through, the book is amazing. I loved the message in the forward. You are great at summarizing our food philosophy.